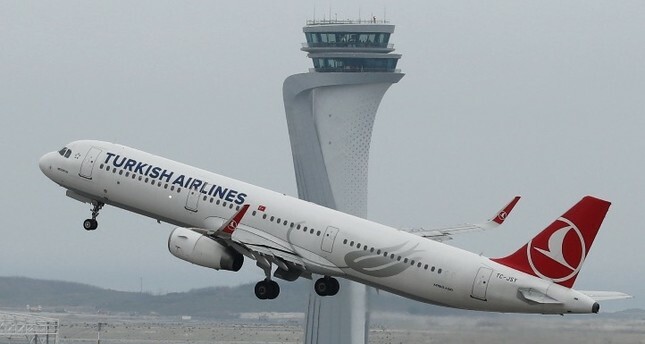 A Turkish Airlines plane takes off from Istanbul Airport, April 6, 2019. Since its mega move to its new home and new aviation center, the national flag carrier Turkish Airlines (THY) has seen its first 1 million passengers at the Istanbul Airport as of Sunday. Since April 6, the carrier has been gradually increasing its flights from Istanbul Airport since its great move from its old home of Atatürk Airport and started operating at full capacity on Friday, when it aimed to carry 895 flights. Including yesterday's flights, THY has reached over 1 million passengers at its new home starting from its first flight at Istanbul Airport at 2 p.m. on April 6. Turkish Airlines General Manager Bilal Ekşi said that THY has carried 841,915 passengers on 4,872 flights since the move. "We will surpass 1 million with today's passengers. It is going fine and will get even better," he said on his social media account yesterday. Already seen as the new center for aviation, Istanbul Airport was officially opened on Oct. 29, 2018 – coinciding with the 95th anniversary of Turkish Republic. It can handle 90 million passengers a year in the current phase of development and despite this being a high figure, it is nothing compared to its potential capacity to serve 200 million after completion of all phases. The airport will operate flights to about 350 destinations worldwide, thus becoming one of the main aviation centers in the world. The world of civil aviation witnessed the greatest logistical operation in its history with THY's move to its new home and the new aviation center of the world: Istanbul Airport. The operation, dubbed the "great move" started at 3 a.m. on April 5. Officials announced that the final move took less time than the estimated 45-hour planning, reaching 96 percent within 33 hours.The flag carrier, which is by far the new airport's biggest user, had to move 10,000 pieces of equipment weighing over 47,000 tons and trucks carried equipment a distance of 400,000 kilometers, traveling an equivalent of going 10 times around the world, from its old home at Atatürk Airport. Over 1,800 personnel were employed during the operation. The load consisted of over 10,000 pieces of equipment, from an aircraft-towing apparatus weighing 44 tons to extremely sensitive materials and was equivalent to a 5,000-truck volume. Established in 1933, THY flies to more than 300 destinations in over 120 countries. In 2018, the company carried 75.2 million passengers with a seat occupancy rate of 82 percent, and this year aims to reach 80 million passengers on domestic and international routes. On the other hand, in the January-March period, the number of passengers at the three airports in Istanbul increased by 210,291 year-on-year, while an increase of 1,897 flights was also observed in air traffic. The average number of passengers per plane was 143 in the first quarter on all flights to and from Istanbul, Atatürk and Sabiha Gökçen airports, according to the data of the General Directorate of State Airports Authority (DHMİ) yesterday. Atatürk Airport, which was closed to commercial flight traffic on April 6, served a total of 15.2 million passengers in the first three months of this year, including 4 million passengers on domestic flights and 11.2 million on international lines. Sabiha Gökçen Airport, on the other hand, served a total of 8 million passengers in the first three months of the year, with 5 million passengers on the domestic lines and around 3 million on the international lines. In January, February and March 2019, a total of 318,182 passengers used Istanbul Airport, including 193,816 domestic and 124,366 international passengers. Thus, a total of 23.6 million people used all three airports in Istanbul in the first quarter. This number saw an increase of 210,291 passengers over 23.4 million passengers served in the same period of the previous year. In that period of this year, 107,072 flights were carried out to and from Atatürk Airport, including 28,777 domestic and 78,295 international flights. The number of flights carried out to and from Sabiha Gökçen International Airport in the three months of the year stood at 54,557 flights, with 32,571 carried out on domestic lines and 21,986 on international lines. In the three-month period, THY scheduled 2,630 flights, including 1,476 domestic and 1,154 international lines, to and from Istanbul Airport. Some 162,362 aircraft used all three airports in the city in the first three months of last year. In the same period of this year, arrivals and departures from all Istanbul airports were calculated as 164,259. Thus, air traffic saw an increase of 1,897 over the same period of the previous year.